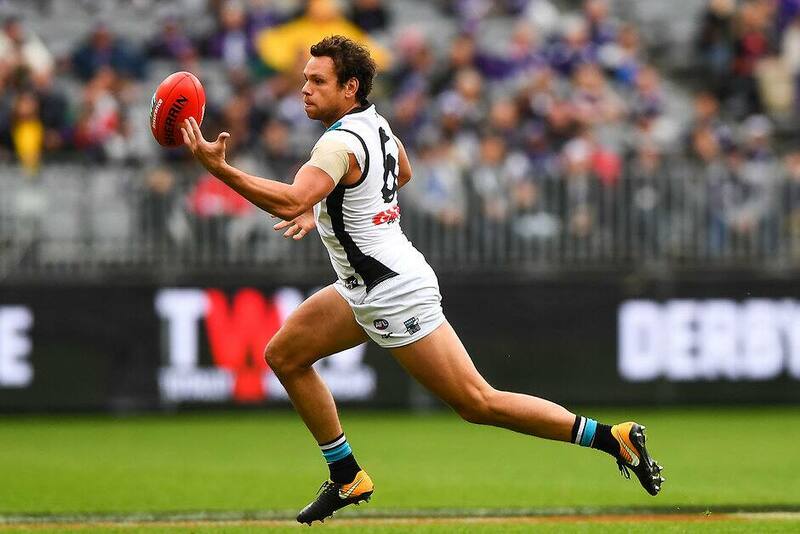 PORT Adelaide utility Steven Motlop wants to get back to playing as an inside midfielder – the role where he enjoyed a career-best season with Geelong in 2015. Motlop, who turns 28 next month, had an up and down first season with the Power last year after joining the club on a four-year deal as a free agent at the end of 2017. He averaged 17.6 disposals per game – his lowest return since his third year in the League in 2012 – but did have moments of brilliance, including kicking the match-winning goal against crosstown rivals Adelaide in their round eight Showdown. Motlop played a variety of roles, including on the wing, across half-forward and through the midfield. But he told AFL.com.au that he's keen for more time as an inside midfielder coming off an injury-free pre-season. "I'd like to be playing a bit more inside mid this year, hopefully I can run through there a bit more and get a bit more exposure in training as well," Motlop said. "This time last year, I missed a fair chunk of pre-season with groin issues and it's good to complete nearly every session so far and put myself in good stead to be fit and ready for round one." Motlop's best season when he was at Geelong was in 2015 when he was deployed at times as an inside midfielder. He averaged 22.1 disposals per game, his highest output for a season, and finished second in the Cats' best and fairest. "I played a little bit (as an inside midfielder) in Geelong in 2015 and a little bit through last year," he said. The shoulder injury to vice-captain Ollie Wines opens the door for Motlop to spend more time as an inside midfielder early in the season. With the likes of Wines, Sam Powell-Pepper and Brad Ebert, the Power have a lot of big bodies through their midfield. "We don't want to be one-dimensional and we don't want to just have big guys in there," Motlop said. "It's up to those big guys to learn roles on the outside as well. "(Powell-Pepper) can be damaging on the outside, so we want him to play on the wing and even forward as well." Motlop said it took him time to adjust to his new surroundings after spending nine seasons with the Cats. "Last year, I was pretty inconsistent," he said. "I tried to find my place in the side and it's a bit daunting coming into a club. "You want to try and earn the respect of your teammates and train hard and earn their respect. "For me, it's about completing this pre-season. "I haven't missed a session, which is great for me, and the body is in great shape."